In this article, we learn about how to login using Google OAuth 2.0 with C#(.NET) or Authenticate Google API in Dot Net. As we know Google OAuth 2.0 requires ClientId and ClientSecret before we proceeding to further step. 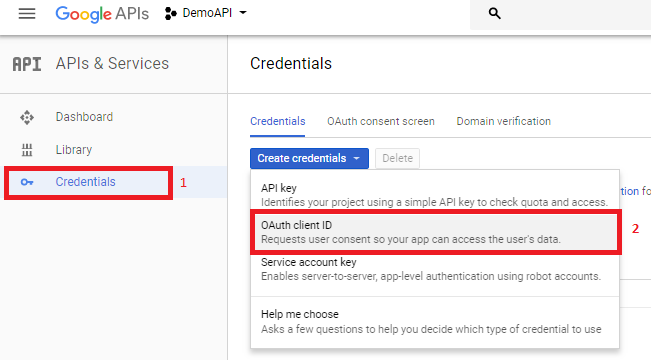 So, first of all, we have to generate ClientId and ClientSecret from Google Developer Console by creating credential or generating a credential for Web Application or from Native Application. I hope you have google account already if not then first create one before proceeding further. 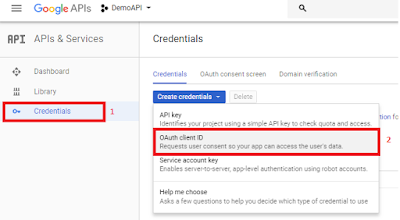 Step 1: Create Credential for OAuth App. Step 2: Select appropriate application type from the available option, Here I have choosed "Other". 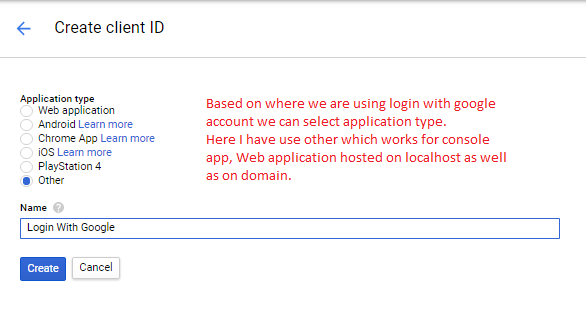 Based on where we are using login with google account we can select an application type. Here I have used "other" which works for a console app, Web application hosted on localhost as well as on all domain custom as well as localhost. Now, you have your ClientId and ClientSecret which will be used for authenticating with Google API using C#. Which grabs ClientId and Client Secret from Web.Config App settings. Used await and task feature for thread safe and as performance improvement and it is already supported by Google API Library. When you put above code in your project and run the app it will redirect to Google Account page for validating your credential and request for granting permission to use your basic profile information for login purpose. If you receive any error it means permission is not given or ClientId or Client Secret key is not valid. 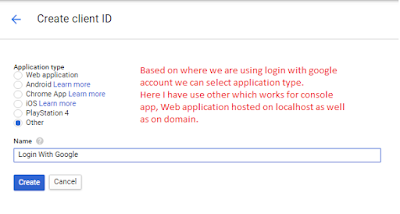 In this article, we have learned about how to create ClientId and Client Secret for a talk with Google API and Login with Google Account functionality using C#.Code.